HOPE is a program that works for mobilization of people with HIV / AIDS to achieve the goal of living in a positive manner with a minor ailment. Through this program, people who are carriers become actively mitigating the impact of the epidemic. From this approach, Humana is currently developing the HOPE Maputo, Mozambique, where HIV infection rates have become a challenge to all levels. Within it, is the project of "Reducing child mortality through improved nutrition and health conditions for orphans and children made vulnerable by HIV / AIDS in Mozambique, Boane District ', implemented in collaboration with Fundacion Tragaluz. -Increasing access, availability and consumption of plant foods rich in nutrients orphaned children and their families. -Increasing in income and consumption of poultry products involved. 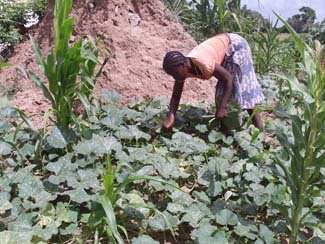 Based on these key challenges, a number of actions implemented, most notably the implementation of a model camp where participants learn new farming practices that then replicate in their own gardens and nurseries. In fact, there are 50 families who have their gardens planted directly in applying the knowledge acquired. Also has established a house with a capacity of 300 chickens. So far have completed four production periods, which have enabled the production of an additional 1,000 chickens, 400 of which were distributed among the families involved. The model field is located in the Day Centre in Beluluane, launched with support from the City of Las Rozas, which people receive information and training on health issues and take the HIV test.Another essential aspect of HOPE programs is to provide care for children orphaned by HIV / AIDS. In the case of this project are 150 children who participate in the activities promoted, most notably the assurance of school attendance, counting with school supplies and uniforms, thanks to which they do not feel discriminated against by other students and the economic differences are not as tangible as before, resulting in self-esteem and social relationships. 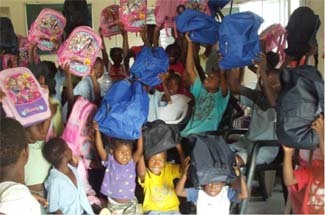 This aspect of helping children is highly valued by the whole community.